"Gilbert & Gaillard" has rated the wine "Boscarelli Vino Nobile di Montepulciano DOCG, Tuscany, Italy" from the vintage 2012 on 22.06.2015 with 89 of 100 points.
" Intense garnet. Inviting nose of morello cherry, plum, some refined spices and flowers. Silky attack leading into a velvety, full and elegant palate framed by a beautiful, closely-integrated structure. More of the focused nose aromas. Promising. Keep a little. " "Gilbert & Gaillard" has rated the wine "Boscarelli Vino Nobile di Montepulciano DOCG, Tuscany, Italy" from the vintage 2010 on 30.06.2013 with 92 of 100 points.
" Dark ruby. Evolved nose displaying wonderful complexity, smoke and mineral aromas with focused scents of violet and cherry. Ample, full mouthfeel supported by dense, well-integrated tannins. Intense, long-lasting finish. Serve with red meats. " "Gilbert & Gaillard" has rated the wine "Boscarelli Vino Nobile di Montepulciano DOCG, Tuscany, Italy" from the vintage 2007 on 10.06.2012 with 92 of 100 points.
" Deep ruby-red. Warm, expressive nose of ripe fruits with balsamic undercurrents. Well-structured, tannic palate showing wonderful savoury minerality and a salty taste. The finish is long and elegant. A handsome wine boasting huge personality. Save for red meats. " 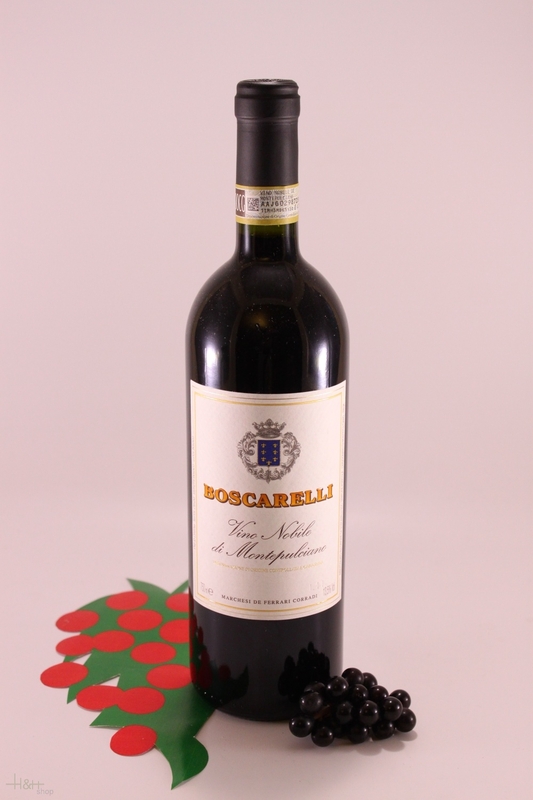 "Gilbert & Gaillard" has rated the wine "Boscarelli Vino Nobile di Montepulciano DOCG, Tuscany, Italy" from the vintage 2009 on 10.06.2012 with 89 of 100 points.
" Ruby-red. The nose is initially centered on caramel, oaked and vegetal aromas then unveils fragrances of cherry and mild spices. The palate is open, fresh and boasts wonderful structure and evident tannins. Serve with roast poultry. " "Gilbert & Gaillard" has rated the wine "Boscarelli Vino Nobile di Montepulciano DOCG, Tuscany, Italy" from the vintage 2006 on 18.07.2011 with 92 of 100 points.
" Intense ruby-red. Mediterranean-style nose augmented by a creamy touch, mushroom and a faint whiff of leather. The palate is supported by noticeable tannins and enriched with spice notes. A wonderful wine that needs to be paired with a black truffle sauce for full enjoyment. " "Gilbert & Gaillard" has rated the wine "Boscarelli Vino Nobile di Montepulciano DOCG, Tuscany, Italy" from the vintage 2008 on 18.07.2011 with 90 of 100 points.
" Deep, brilliant ruby-red. Enticing nose blending dried fig, oaked notes and black pepper. Full-bodied palate developing a broader range of aromatics (black fruit, caramel, liquorice, tobaccoâ€¦). Focused finish. Drink with nutmeg-flavoured white meat. " "Wine & Spirits Magazine" has rated the wine "Boscarelli Vino Nobile di Montepulciano DOCG, Tuscany, Italy" from the vintage 2013 on 01.04.2017 with 92 of 100 points. "Wine Spectator" has rated the wine "Boscarelli Vino Nobile di Montepulciano DOCG, Tuscany, Italy" from the vintage 2013 on 30.06.2016 with 89 of 100 points. "Falstaff Magazin" has rated the wine "Boscarelli Vino Nobile di Montepulciano DOCG, Tuscany, Italy" from the vintage 2013 on 31.05.2016 with 90 of 100 points. "Wine & Spirits Magazine" has rated the wine "Boscarelli Vino Nobile di Montepulciano DOCG, Tuscany, Italy" from the vintage 2012 on 01.04.2016 with 92 of 100 points. "Wine Spectator" has rated the wine "Boscarelli Vino Nobile di Montepulciano DOCG, Tuscany, Italy" from the vintage 2012 on 31.10.2015 with 93 of 100 points.